Fancy a smoked ribeye sandwich? 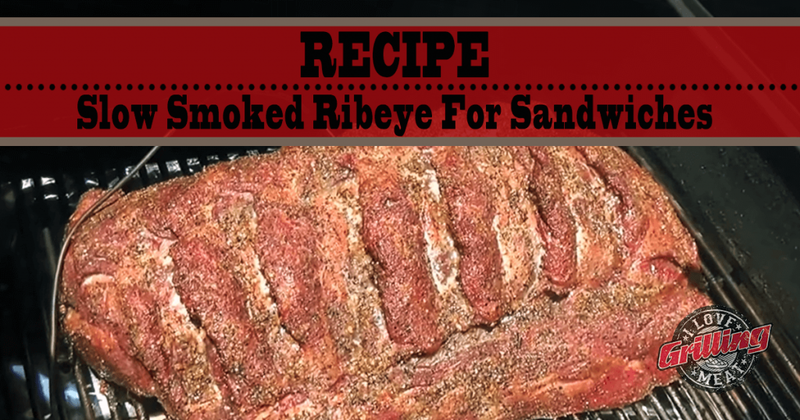 Here’s the best way to smoke a whole ribeye to use in your sandwiches, burgers, or any other delicious BBQ project. If you get a boneless ribeye, there’s not a lot of trimming to be done. You might want to trim down the fat side a little, but you can leave it in tact as well. Rub the ribeye with olive oil. This will help the meat brown and also allow the seasoning to stick on better. Spread your all-purpose rub. You’re working with a big piece of meat, so apply it liberally, covering all sides. Next, apply the Montreal seasoning in the same fashion. Pat it down to make sure it sticks to the meat. Preheat your smoker to 250°F, then place the ribeye in there. The cook will take approximately 15 minutes per pound. If you are using a thermometer probe, your target internal temperature is 128°F. Once it hits that internal temp, pull it off the smoker. Then wrap it in foil and let it rest for 2 hours in a dry cooler. After letting it rest, slice it as thin or thick as you like, and make some mouthwatering smoked ribeye sandwiches! Philly Cheese Steak Grilled Stuffed Peppers Seared Ribeye steak inside grilled stuffed peppers? Yes please! This recipe can be served both as a side dish or as a main course that everyone will enjoy. How to Trim Ribeye Steak from a Prime Rib Roast Selecting the perfect ribeye steak: there are many different opinions on the matter. The following video will try to make things clear to you, so you can select the ribeye steak that you really want. Classic Grilled Ribeye Steak Recipe Ribeye steak has become the symbol of American BBQ around the world. So here’s an old-school ribeye steak recipe the way it used to be made back in the day.